Summary: People are concerned about the potential of GMO food to cause allergies. However, the technology used for making GMO crops does not necessarily make us more vulnerable than conventional breeding. Comprehensive evaluation for market approval, food safety surveillance, and adequate labeling could minimize the health risks of food allergies. Moreover, further development of technology might even enable us to remove the common allergens in our food. In the autumn of 2000, a California woman named Grace Booth went into anaphylactic shock after eating three corn tacos; after ruling out all other food allergies, she became suspicious about the corn in the tortillas. Earlier that year, the consumer group Genetically Engineered Food Alert found that some Taco Bell shells, along with other corn products, contain a pest-repelling protein called Cry9C. Originally from common soil bacteria, Cry9C can specifically destroy insect intestine and was introduced into StarLink GMO corn to kill predatory caterpillars (see this article). The StarLink corn had only been approved for animal feeding, and was never intended for human consumption because of concerns that Cry9C would be difficult to digest and cause an allergic reaction. However, it still entered the human supply due to cross-pollination when the GMO corn was planted too close to unmodified crops, and the tortillas that Grace ate were soon recalled due to contamination from a GMO product (Figure 1). 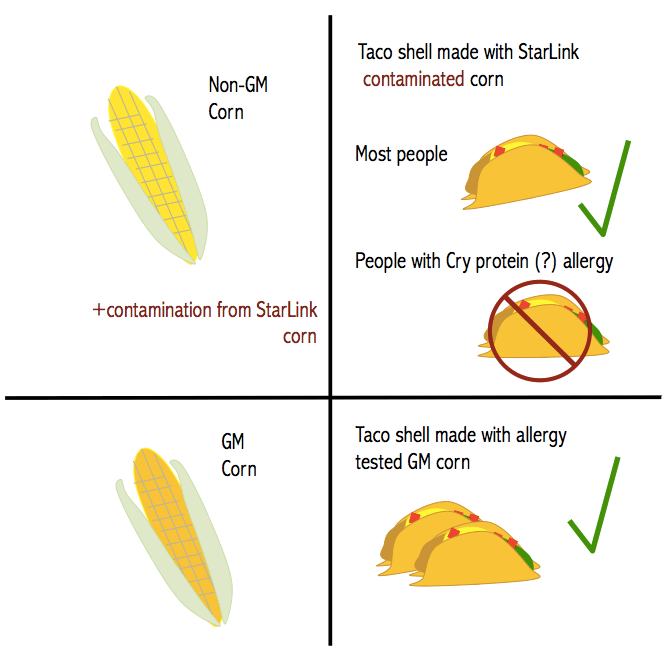 Although the Food and Drug Administration (FDA) did not find a direct link between Cry9C and allergic reactions in the consumers who claimed to have ingested StarLink corn, this recall spurred public discussion about the health risks of GMO foods. As a result, the scientific community is often asked if GMO foods make us more vulnerable to allergens, and how we can mitigate these potential risks. Figure 1. Contamination of non-GM corn with GM corn StarLink containing the Cry9C protein may have caused an allergic reaction in one Taco Bell customer. It was not possible to prove a direct link between the Cry protein and the allergic reaction, but many believe this protien to be the culprit. Importantly, although many people ate the contaminated tacos, they were not all affected. Like any allergy, only those allergic to the allergen present in the contaminating corn would have an adverse reaction. An “allergy” is a hypersensitive immune response that occurs when a person comes into contact with specific substances called allergens. Allergies can lead to red eyes, itchy rash, swelling, runny nose, and breathing difficulties. Allergies are very common, and food-specific allergies affect 240-550 million people in the world. In the US, 1 in every 13 children has a food allergy, and the prevalence of childhood allergies has increased by more than 50% in the last 20 years. A combination of host and environmental factors determine the intensity of allergic reactions: increased vulnerability can be attributed to various factors including changes in lifestyle, hygiene, diet, and physical activity. However, there is no evidence that GMOs are any more or less allergenic than their non-modified counterparts. Ninety percent of food allergies are caused by the common allergens in peanuts, tree nuts, milk, eggs, wheat, soy, shellfish, and fish. In 1996, researchers found that the main allergen from Brazil nuts retains its allergenicity after being transferred into a GMO soybean; the Brazil nut GMO soybean has never been approved for the market, and this case helped establish the policy that any protein that has been shown or even suspected to cause an allergic reaction should never be introduced into a GMO crops. According to the international principles of food safety (FAO/WHO), before any GMO food gets market approval, the structure of the introduced protein should be compared to all known allergens. Potential allergenicity is then further analyzed with comprehensive experiments. Additionally, as part of post-marketing monitoring, randomly sampled consumers are examined to detect previously unidentified allergenicity. Currently, around 30 GMO crops have received approval in the US, and most of our corn, soybeans, and cotton are GMO crops. To date, no allergens have been found in GMO products approved for human consumption. Since GMO market approval is under strict regulation, we should probably be more concerned about contamination from unauthorized GMOs (such as StarLink corn) than about allergies to common GMO foods. GMO plants can spread their genes to conventional crops through cross-pollination. To avoid such occurrences, there are guidelines stipulating that GMO plants should be physically segregated from the closely related plants by a buffer zone that is sized proportionally to how far the pollen can travel; however, it must be considered that not all farmers will obey these guidelines, and some pollen can travel unexpectedly long distances via bees or other pollinators. With this in mind, the European Union (EU) scientific committee on plants states that contamination is unavoidable, and therefore, the consequences of contamination should be considered before market approval. However, if contamination occurs, it is possible to eliminate the food containing the suspicious or unexpected allergens via a robust safety surveillance system. In fact, the scrutiny for common allergens in our food supply has been in practice long before the emergence of GMO foods. After the recall of StarLink corn and the subsequent ending of its planting, the presence of Cry9C residues was monitored for many years until the corn supply was essentially free of StarLink. As different individuals can be allergic to different foods, the major risk of food allergy comes from unwitting ingestion of the allergen. Therefore, it will be helpful for every consumer to know the exact composition of their food, where it is genetically modified or not. Mandatory labeling of GMO ingredients, which has been required by law in the EU but not the US, could help consumers identify the potential allergens and facilitate the recall process, if necessary. However, unless it involves common allergens such as gluten and peanuts, the labeling of even non-GMO food is often inadequate. Thus, there does not appear to be particular bias towards poor labeling in GMO foods only. Figure 2. GMOs could be used to remove allergens from food, allowing those with allergies to eat food that they previously couldn’t. This technology is still in development, but it could be the future of staying allergen-free. With appropriate oversight, the technology used for engineering GMO crops need not cause more allergic responses than conventional breeding. On the contrary, we rely on GMO technology to overcome some of the most difficult challenges for food safety. For example, to prevent contamination, scientists are engineering GMO crops to only self-pollinate or fertilize with manual assistance[1,8]. Additionally, it has recently been reported that scientists can reduce or remove the common allergens in our crops with GMO technology (Figure 2). This was most strikingly demonstrated by an international team of researchers that suppressed the enzyme responsible for making gluten in wheat, leading to a resulting GMO wheat with a 76.4% reduction of gluten in its seeds. 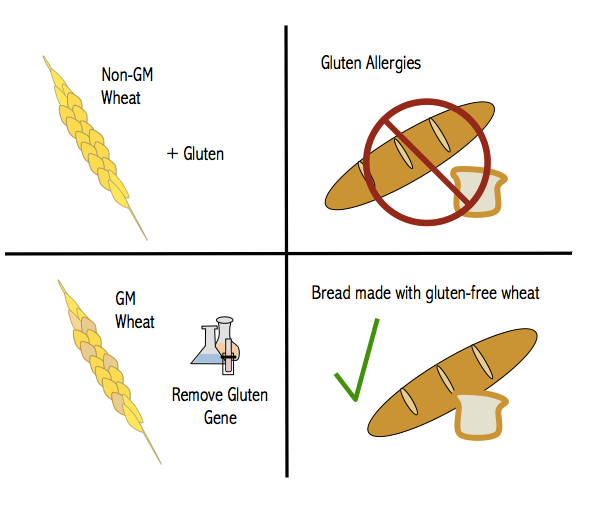 Admittedly, there is still a long way to go before we could enjoy a roll of bread made from gluten-free GMO wheat, but such preliminary success has inspired us to believe in that future development of GMO technology could become a solution to, rather than a cause of, food allergies. 2. Pollak A. (2000). Kraft recalls taco shells with bioengineered corn. New York Times. 4. Celec, P et al. (2005). Biological and biomedical aspects of genetically modified food. Biomed Pharmacother 59, 531-540. 6. Haslberger A. (2001). GMO contamination of seeds. Nat Biotechnol 19, 613. 9. NIAID-Sponsored Expert Panel. Guidelines for the diagnosis and management of food allergy in the United States: Report of the NIAID-sponsored expert panel. J Allergy ClinImmunol.2010; 126(6):S1-S58. 10. Nordlee, JA,et al. (1996). Identification of a Brazil-nut allergen in transgenic soybeans. N Engl J Med 334, 688-692. Why do you mention this but not address the reasons? Especially since GMO products have been on the market just 20 years. Strange coincidence. The problem of ingesting known allergens can be solved by that hotly disputed topic – labeling. What continues to baffle me about the resistance to mandatory labeling of GMO’s is the simple fact that in a democratic society suppression of information runs counter to the very foundations of democracy — and now with the epidemic of allergies — our health. The only entities that have anything to gain from suppression of information that many people find vital to their health are the companies and industry associations that stand to profit. In their quest to defend GMO science, the scientists refuse to ask the simple question — WHY? Furthermore, in the current scientific environment, ANY information that runs counter to the argument for patent acceptance of GMOs on the whole is labeled as anti-science and dismissed. So what about the science that proves one specific GMO crop is deleterious — is this not science? But when any scientist dares to go against prevailing popular science he/she is dismissed and vilified, quite often marginalized by the scientific community. To lump every single GMO in one category as across the board safe for human consumption is ignorance and highlights the arrogance of the scientific community. So if Round-up ready corn is proven harmful should every other GMO crop be dismissed as well? If one follows the current “science” logic then yes. Hence the polarities on both sides. Sad that scientists dismiss anti-GMO people for the exact ideological inflexibility that they are guilty of themselves as well as undermining thorough science. Hi Joan, Thanks for reading the article! First of all, there’s no data (at least that I know of–feel free to provide if you have it) linking GMOs to the rising prevalence of allergies. Lots of things have changed in the last 20 years, including the prevalence of organic foods, for example–correlation does not prove causation! In fact, scientists have asked why allergies are increasing, and the leading idea is the “hygiene hypothesis” (see http://www.aaaai.org/conditions-and-treatments/library/allergy-library/prevalence-of-allergies-and-asthma.aspx). Secondly, I think we’re more in agreement than you might realize. Charles notes that there there IS science that shows that specific GMO crops are allergenic AND these crops have not been approved for human consumption because of that science. Also, as a scientist, I have seen studies about GMOs that concern me–such as the creation of superweeds that results from the farming practices encouraged by RoundUp Ready crops, or the increased use of pesticides associated with them (see the article in this edition about RoundUp Ready crops). So I disagree with your assertion that any anti-GMO studies are dismissed as anti-science. In fact, I am also concerned about my health and what I eat, but I am convinced by the studies I have read that GMOs as a whole (or any GMOs currently available for human consumption) are not harmful to our health. I’d be interested to read any studies you have that have convinced you otherwise–I have had a hard time finding any! I do, however, think that individual GMOs should each be tested and regulated and not all lumped together as safe. And as for labeling, this article is not against labeling GMOs–instead, it is pro-labeling allergens. I feel that treating all GMOs the same in labeling is actually not that informative to the consumer (though I wouldn’t say I am anti-labeling). Because knowing that a food product contains GMOs actually tells you very little about the potential allergens in it or potential adverse health effects, it seems like a more specific labeling system would be more better (e.g. if the label said “contains Cry9C”). Read our interview with Dan Voytas (also in this special edition) to see what another scientist thinks about labeling. Happy to share many more bits of info but will do so over email. Thanks for posting. I read the website you posted at the end. But unfortunately most of the health risks they have listed bears no citation. For example, “The process of creating a GMO can introduce new allergens or elevate existing ones. Both GM soy and corn contain new unintended allergenic proteins, and GM soy has as much as seven times higher levels of a natural soy allergen—trypsin inhibitor.” I cannot trace who performed such study and where was it published. Therefore, I do not know how the experiments were designed, and whether the results were interpreted properly. I understand when new things/ technology emerges, especially when it is related to our food supply, people are concerned about its safety. However, such concern does not suffice to exempt anti-GMO studies from peer-review, the basic standard for all scientific research. Admittedly the GMO industries could try to prevent the message that might affect their development from spreading, but their influence is not overriding in the academia. It will be more valuable than blindly objection, if anti-GMO activists can start working with scientists to test their hypothesis/ suspicion with experiments. I look forward to read and analyze the peer-reviewed studies if they could indicate the health risks of GMO product. Allergens are “foreign proteins”. Immune system function operates as the human gate-keeper for health by monitoring those elements being ingested into the organism: food, water, environmental materials=pollen dust… and those which the system doesn’t recognize as friendly/familiar, thus begins the immune system function of isolating and eliminating the threat. GMOs, by their very nature, are unique man-engineered organisms that are impossible to occur in nature, and unique as proven by the issuance of US Patent designation. There has been no co-evolutionary familiarity between humans and animals with GMOs because 1st generation introduction of GMO proteins only started in 1996….without the public being informed as to the presence of these mutant proteins. Allergenicity is a reality where patented genetic anomaly is the entire basis for GMO commercial interests. I think this article started off on the right foot with the title, but erred towards industry orthodoxy and supporting a false premise. Thanks for reading! We agree that there is the possibility of introducing allergenic proteins into foods by genetic engineering. This is why the article supports regulation and allergenicity testing of all GM foods. However, there is no evidence that genetic engineering itself causes a food to become allergenic (it all depends on what you put in there!). Some GM foods have proteins from other foods: for example the GM apple that browns less easily has genes from other apples (http://sitn.hms.harvard.edu/flash/2015/how-to-make-a-gmo/). While I understand that you may be skeptical about adding genes/proteins from bacteria with which “there has been no co-evolutionary familiarity between humans and animals”, this is not the case for all GM foods (especially those that have genes from other foods). Personally, I think that with adequate testing, we should be able to add proteins even from bacteria or other non-food species, but regulation is really important in that case. Furthermore, next generation GMOs (see: http://sitn.hms.harvard.edu/flash/2015/not-your-grandfathers-gmos/) are actually working to inactivate genes and proteins already in plants INSTEAD of adding foreign proteins. These GMOs carry very little risk for allergenicity, as they have no foreign material. That’s why I think that GMO labeling should include what proteins are put into the GMOs–a broad labeling of GMOs is not useful, as GMO can mean so many different things. And because, again, there’s no evidence that the act of genetic engineering results in allergenicity. Interesting article, yet the defence used that “there is no evidence XYZ causes allergenicity” is dishonest. Food Standards in Aus/NZ rely entirely on the corporation testing its genetically tampered foodstuffs, and naturally, having spent a lot of money, they “find nothing wrong with it”. “There is no (independent) evidence” should mean: ‘we need to properly test’, not “go ahead”. I would suggest that it is not an allergy to the chemical, but the fact that the chemical is poison and different people have different thresholds as to when they will react to the poison. Allergic reactions and reactions to poison are generally different. A true allergen causes a reaction of the immune system, which is what we’re talking about here. I’m sorry, but mere coincidence that food allergies have shot off the charts during the same period that GMO’s were introduced is ridiculous. Mankind has been ingesting food crops for a very long time with few ill effects. I’ve been concerned about pesticides, herbicides, and fumigants used also, but the strong time correlation between the introduction of GMOs and highly increased food allergies seems obvious. The onslaught of chemicals in products we ingest and use for/put on our bodies is overwhelming to us, no doubt. Cancers are on the rise and seem to be accelerating. Maybe cell phone/microwave exposure is causing brain tumors–who knows really? Brain cancer was rare as far as I know when I was growing up in the 1960’s. It is not any longer surprising to hear someone has cancer in their brain. We’re poisoning ourselves. We feed animals with food made from other animals. We put toxins as preservatives in vaccines. It’s all meant for good–efficiency, protecting us, feedibg the world, etc. But it is killing us. We need to stop the experimenting on unknowing consumers. I would like to point out that sometimes things are really mere coincidences. Also, genetically modified foods weren’t the only thing to happen in that timeframe. You say that brain cancer was rare when you were growing up, and so was probably things like autism and Asperger’s syndrome. However, they likely weren’t nearly as rare as you think. The amount of those being prescribed has increased, but mainly due to breakthroughs in understanding and finding those things. The rate might have increased, but not nearly as much as thought because doctors now know what to look for and have the machines to let them see. After all, cancer of the internal organs or brain, without the advanced medical machines, would only be seen as death by natural causes. Do you have any evidence to support you claim or cases that have been reported relating to allergic reactions caused by GMOs or anything because the cdc shows that allergies in children have increases 3.4% – 5.1% but no evidence has linked gmo to allergies and the FDA reguires gmo foods to meet the same requirements as other foods. I really appreciate this article, and think there should be more serious research done on this question. I am very suspicious that something in GM corn has caused me to have hives (urticaria). I have had chronic urticaria symptoms for over a year now, and when those symptoms are flaring up, I always notice an acute, correlated worsening in my intestinal/bowel health. I’ve learned which foods I need to avoid in order to avoid hives without popping cetirizine (antihistamine med.) all the time, such as gluten, refined sugar, milk from A1-protein-predominant cows, eggs, cinnamon, raw garlic, caffeine, and leftovers/more bacteria-laden foods. In addition, on recent days in which I ate none of these offending foods (even checking ingredients lists for sugar and gluten which are often unnecessary lurking ingredients), but on which I did eat corn tortillas, I also broke out in hives. I don’t think this is an allergy to corn itself because I’m fine eating fresh organic corn on the cob.But when I read about the bacterial gene “bt toxin”, used in much GMO corn on the market, and how it is spliced into corn genes in order to destroy the gastrointestinal tract of insects just as the bacteria itself does, I can’t help but be strongly suspicious that this GM corn is causing a low level of the same thing in my GI tract, leading to an allergic reaction by way of acutely increased intestinal permeability, which allows toxins to “leak” into the blood along with the nutrients, through acutely inflamed intestinal tight junctions (this is known as “leaky gut” syndrome in alternative/natural health circles, although I’m not sure if it will be taken seriously by everyone reading this post). If this were the case, would it not would mean that GM crops having bt toxin would induce allergies in those like myself with pre-existing allergic conditions or compromised immune systems? It’s possible that you could be allergic to Bt toxin and that hives (but not, as far as I’m aware, “leaky gut”) can be a symptom of an allergic reaction. If you were allergic to the proteins in Bt, then it would likely be due to a reaction by your immune system not any effect on the GI tract. Bt toxin is actually also a commonly used organic pesticide (see here for more information on Bt http://sitn.hms.harvard.edu/flash/2015/insecticidal-plants/), so if you are indeed allergic to Bt, you’d expect to experience symptoms from a lot of produce, not just GM produce. Levels of Bt that end up in our food are actually generally higher in organic produce than in GM produce with the Bt gene added. Thank you for your reply, that is quite interesting that bt toxin is used in organic produce, since I haven’t observed any allergic reactions to produce. My background is in engineering, not medicine or even biology, so it helps considerably to hear from those who’re probably more knowledgeable in these fields as I have been trying to learn as much as I can in my spare about this. Regarding the cause of hives- yes, the immediate cause (or mediating factor) is histamine released by mast cells and basophils (which are part of the immune system). However, I’m still left with the question: is it unlikely that the way in which those cells first come into contact with (or the way in which the immune system first becomes “aware” of) an allergen or toxin is through higher-than-normal intestinal permeability (the term for leaky gut used in the medical literature) caused by inflammation of the GI tract? If so, why? I’m not an expert in gastroenterology, but I think there are links between intestinal permeability and food allergy (not sure if the direction of causality is determined). See https://bmcgastroenterol.biomedcentral.com/articles/10.1186/s12876-014-0189-7 and https://www.ncbi.nlm.nih.gov/pmc/articles/PMC4266989/ for somewhat technical studies of the scientific research. However, as far as I’m aware, there’s not any evidence that bt toxin directly affects intestinal permeability in humans since the way it acts in insects is really specific to actually only certain types of insects (see the article I linked before for more info). Thanks so much! Will definitely check out the links. So I’ve got nothing substantial to say here; just doing research for a high school paper I’m writing, but can I congratulate you for perhaps the most decent, thoughtful, respectful comments section on this topic on the whole Internet? It’s genuinely refreshing to see this kind of dialogue on such a messy issue. Previous Previous post: GMOs and Pesticides: Helpful or Harmful?